What's on your mind? Click here and let us know! It’s hard to believe that we’ve made it this far into the year already. It really feels like we’ve just packed away the decorations from last Christmas, and here we are already, knocking on the door of opening day of deer hunting and Thanksgiving. It’s a busy time of year for everyone with many things to concern oneself with; dinners, shopping, and decorating just to name a few. We also provide a few events at the funeral home to fill out this holiday time of year. The first activity is quickly coming upon us on Thanksgiving Morning. The second annual “Wobbly Gobble”; a day to give thanks that you can wobble. 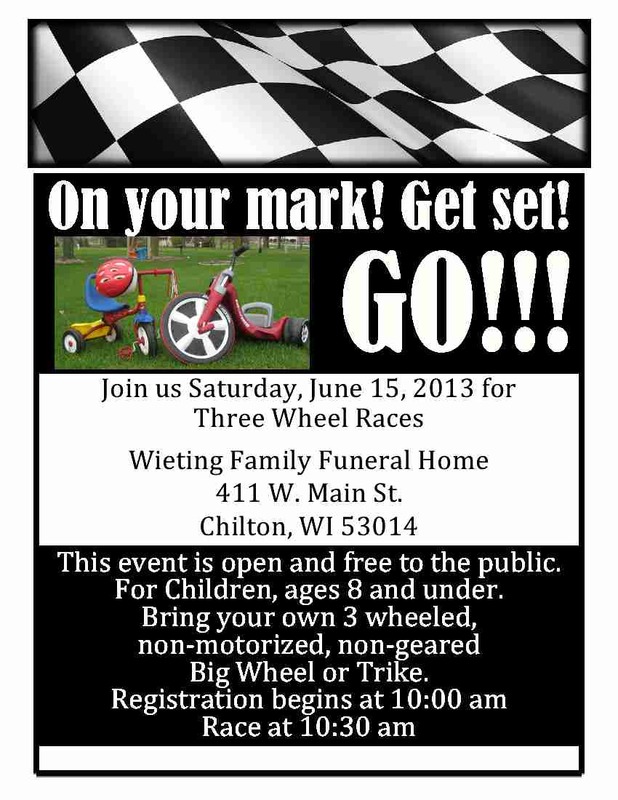 It’s a 3 mile walk/run starting at the funeral home in Chilton at 7:30 am. It’s a good way to begin your Thanksgiving before heading out to join family for other holiday festivities. You’re invited to join us that morning; feel free to come and wobble by yourself, or bring a friend or a large group to wobble with. We’ll see you there! The Holidays can be an especially difficult time for families who have experienced the death of someone they love. In December, we recognize those who have died and left a void especially prevalent during this time of the year. This year’s program will take place on December 4, 2016 at 4:00 pm at the Wieting Family Funeral Home in Chilton. Anyone is welcome to attend. Registration is required for planning purposes. You may register by calling (920) 849-4941. It is our hope and our prayer that everyone enjoys this blessed time of the year and appreciates everyone in their lives who bring them love and happiness. A while back, I told you a little bit about some misconceptions people may have about funerals. In this post, I wish to convey the purpose of the funeral. Personalized funeral ceremonies provide an outlet for survivors to acknowledge their loss and experience their pain in ways that can be full of meaning. Funerals have been with us since the beginning of human history because they help us move from life before death to life after death. Funerals confirm that someone we love has died. MIA is more painful than DOA. Knowing is better than not knowing. This is why funerals bring us face to face with what has really happened. That confirmation of death is a sort of comfort for those whose lives press forward. Funerals encourage us to embrace and express our pain. Funerals are a safe place to grieve openly. The Bible tells us in the 5th chapter of Matthew: “Blessed are those who mourn, for they will be comforted.” Funerals offer a time where grieving individuals are surrounded by the love and support of other family, friends and members of the surrounding community. Funerals help integrate mourners back into the community. Life after the death of a loved one will never be the same. Funeral are a place that the friends and acquaintances offer not only emotional support, but also social support. Community helps to lessen that sense of loneliness after the death of a loved one. I would once again like to offer myself to you as a resource for your church, class or civic group. I am available to come speak about any death, dying, grief and funeral topics you may want more information on. Wieting Family Funeral Home, Your Local Pekin Insurance Pathway Agency in Chilton and Kiel, Wisconsin, is honoring those who served in our military by supporting the Honor Flight Network, which honors American veterans for all their sacrifices. Wieting Family Funeral Home participated in the annual Tour of Honor Contest sponsored by Pekin Insurance. For every funeral trust established, money was donated to the Honor Flight Network which transports veterans to Washington, D.C., to visit and reflect at their memorials. This is a small tribute to those who gave so much. Thanks to the combined efforts of the Pekin Insurance independent agency force, the company donated $20,000.00 to this cause. Wieting Family Funeral Home, Pekin Insurance, and its other independent agencies thank the men and women who made the sacrifice and commitment to fight for the freedom and safety of our country. Wieting Family Funeral Home can assist you with Advanced Funeral Planning Services, and Advanced Funeral Funding. For more information, please visit www.wietingfuneralhome.com, and look under the ‘Services’ tab at the top of the home page. We are honored to be able to remember and pay tribute to the men and women who have defended our country and preserved our freedom. We especially recognize the veterans and their families whom we have served this past year at our funeral home. This program is free and open to the public; however, registration is desired for planning purposes. If anyone would like to remember a veteran or to register to attend, please call the funeral home at (920) 849-4941 or (920) 894-4943. For more information, please visit our website: wietingfuneralhome.com and click on the "Let Freedom Ring" banner on the homepage. It isn't uncommon for us on a semi frequent basis to be asked, "Why do we have funerals?" This is, truly, a tough question to answer, especially when asked by family members who have suffered the death of someone they love. So...why do we have funerals? Margaret Mead, a foremost anthropologist, described America's increasingly common response to death as follows, "When a baby is born, we rejoice. When a couple is married, we celebrate. And when someone we love dies, we pretend nothing happened." Many people today don't understand why we have funerals. Things that we don't understand, we tend to be skeptical of, even fearful of. There are many misconceptions people have about funerals, but I'd like to highlight a number that tend to turn up the most frequent. Funerals make us sad - When someone we love dies, we NEED to be sad. Funerals provide us with a safe, supportive place in which to embrace the pain we have when we've suffered the death of someone we love. Funerals are inconvenient - Taking a few hours out of your week to demonstrate your love for the person who died, and your support for his or her survivors is a privilege, not an inconvenience. Funerals are rote and meaningless - They don't have to be. We are always stressing that Every Life Tells a Story. With forethought and planning, funerals can and should be personalized rituals reflecting the uniqueness of the deceased and their grieving family. Funerals provide an opportunity to tell that story which can be shared for generations to come. Funerals are only for grown-ups - Anyone old enough to love is old enough to mourn. Children, too, have the right and privilege to attend funerals. I've heard frequently that adults have 'learned a thing or two' from children who are grieving as well. Most of my help is now coming in the form of what we call "aftercare". There are really two components of aftercare. One being grief related and the other being financial. I have focused on grief aftercare in past articles so this article will be focused on financial aftercare. My friend's sister, who I will refer to as Nancy, suffered from medical issues for quite some time, but they weren't deemed to be so serious as to think that death would occur so quickly. Nancy was a very independent person. She was a single parent who raised a wonderful son while also having a very successful career. She was always going to "get to that" financial planning and estate planning "stuff". But, not unlike a lot of people, she ran out of time. So, as a result, when she died somewhat unexpectedly, her financial affairs weren't quite in order. Because Nancy hadn't had the chance to put things in order, the family is now faced with the daunting task of settling her estate. Anyone who has gone through this process knows the amount of time and effort this takes, especially when there is not a will, nor any direction whatsoever. Each person's estate is different and can be fairly simple or extremely complex depending on the amount of assets and /or debts. As part of our service to our families, we have many different forms and suggestions available to families that will assist them. One good example is a form letter to credit card companies canceling credit card accounts. When settling estates, especially unexpectedly, there are many, "wow, we never thought about that" moments. We also will assist you with Social Security notification. We will send Social Security all of the information they need so you don't have to contact them at all. Life insurance tends to be a hurdle depending on the company. We'll help families initiate the contact with the appropriate places to get the ball rolling on filing claim information. The insurance companies, by law, have a month to respond to the death claim; however, most companies are quicker than that, especially when the claims are filed promptly. Another area, albeit, not necessarily financial is how to deal with canceling any online and social media accounts a person may have had. Many people pay their bills online today and as we all know, there are passwords upon passwords and then more passwords to get into anything online. Many companies (rightfully so) are very strict about giving out password information over the phone, because of the potential for "hacking". Also, as foolish and unimportant as canceling a Facebook account might seem, it is important to do. Unless you are going to actively maintain the deceased persons Facebook account as a memorial, it is best to cancel to avoid any embarrassing or untimely "hacking" situations. Ultimately, the best thing to do is make your estate planning a priority no matter what your age. You can do a lot of estate planning just by writing things down and putting it in a safe place (and telling somebody where it is! ), but the best thing to do is contact an attorney to help you. However, if you do find yourself in a situation like my friend is with her sister Nancy's estate, don't hesitate to call upon us. We will do all we can to help, and we will get you pointed in the right direction. Wieting Family Funeral Home has always been ahead of the curve when it came to technology in the funeral service sector. Recently, Wieting began a long and arduous journey to update our funeral home's website. "We decided that instead of just tweaking a few things here and there within our current site, we would start from scratch, and have a web presence that would be able to disseminate more and various information to more people quicker," Wieting said. The new site was unveiled in February. One of Wieting's favorite parts of this new site is the photo gallery. Viewers will see photos of area landmarks, and pictures from community events they have sponsored. "In the very near future, we'll be incorporating more and more video to the site as well," Wieting said. "This provides a way to relay more information quicker and is more apt to hold someone's attention than large amounts of text. We'll be starting with part one of a three-part series about the history of our family in funeral service." One of the principal functions of our funeral home's website is to give access to obituary and service information. People may voluntarily sign up to receive email notification when a new notice is placed online at www.wietingfuneralhome.com. When a new obituary is posted, viewers will be notified of that addition. When looking at an obituary on the website, viewers will notice that below the primary photo there is a list of ways to share that notice. Viewers can click to email the obituary to friends and family, or post it to social sites like Facebook, Twitter, or Google+. These obituaries are also have places to offer a short condolence to the family under the Memory Book tab, or share a long story or memory under the Life Stories tab. Wieting also publish a quarterly newsletter. Viewers can subscribe by scrolling to the bottom of the homepage and entering your email address on the right side under the heading "sign me up for our newsletter"
"If there is something you'd like us to blog on, please let us know by emailing us.," Wieting said. In connection to the new website, Wieting also begun to become active within the social sites. The company does have an active Facebook page. Also Wieting is starting to dabble in a YouTube Channel and Google+. For more information visit www.WietingFuneralHome.com. History was one of my worst subjects in school. I hated it with a passion and usually did just enough to pass. I have to admit; as I get older I have much more of an appreciation for history and now have a keen interest in it. Last night I finally went to see the movie Lincoln and I was embarrassed by the fact that I didn't know a lot about the story. As a funeral director most of the history I have learned has come from listening to people who belong to "The Greatest Generation." 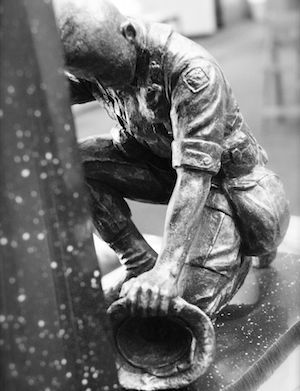 The Greatest Generation is a term coined by journalist Tom Brokaw to describe the generation who grew up in the United States during the deprivation of the Great Depression, and then went on to fight in World War II, as well as those whose productivity within the war’s home front made a decisive material contribution to the war effort. I absolutely loved listening to the stories told by family members of a loved one who was a part of this great generation. The stories of how mom met dad during the war when she was a nurse and he was a G.I. The stories of how a family of ten somehow made ends meet with little or no money and how the children didn't even know they were poor because they never knew what it was like to have money. And they were happy. Along with these stories are the pictures, actual photographs taken during this unique time in our history. Actually, the pictures are what spawn the stories. I specifically talk about The Greatest Generation because these are the pictures and stories I have been most exposed to during my career. I also talk about it because I, like many of you, feel that this was a special time in our history. I may not have lived during this time, but hearing the stories and seeing the pictures certainly has contributed to my renewed interest in history. Sadly, The Greatest Generation like all generations before it, is slowly slipping away and it is up to us to preserve their history and keep telling their stories. If you haven’t had a chance to sit down and talk with someone who lived through the Depression Years, I urge you to take the time to do it. If you know mom or dad has pictures hidden away in the attic or sitting in a dusty photo album, urge them to get them out and tell their stories. Make an afternoon out of it and be sure to bring the grandchildren and great grandchildren. You will be glad you did and you might even hear a story or two you’ve never heard before. Now…..back to my history book. Hello and thank you for stopping by our blog. Wieting Family Funeral Home is family owned and operated with two locations to assist your family. This blog is intended to provide you with news, information, and answers to your most important questions. If you are looking to plan a memorable funeral service in Chilton, Wisconsin our Licensed Funeral Directors are available for assistance. Since 1953, we have served the community and always offer the guidance, care, and support that is needed to carry out and plan a funeral for your loved one. Visit our location or call us today. In need of a funeral home in Kiel? Wieting Funeral Home has served the community of Kiel for many years and is ready to assist you. Our helpful staff of funeral Directors can handle everything to ensure a memorable funeral for your loved one. Planning a funeral while in mourning is one of the hardest things to endure and we understand the difficulties you may experience. We are here to take care of the planning, paperwork, and service so that you can focus on what is most important, family. In this article, Licensed Funeral Director, Patrick Fahrenkrug of Wieting Family Funeral Home shares advice for Post Holiday Grief.